All parents out there, check out this free custom promo gift by NutiFood! What better way to promote your brand’s first baby nutritional food than a custom bowl to go along with it? 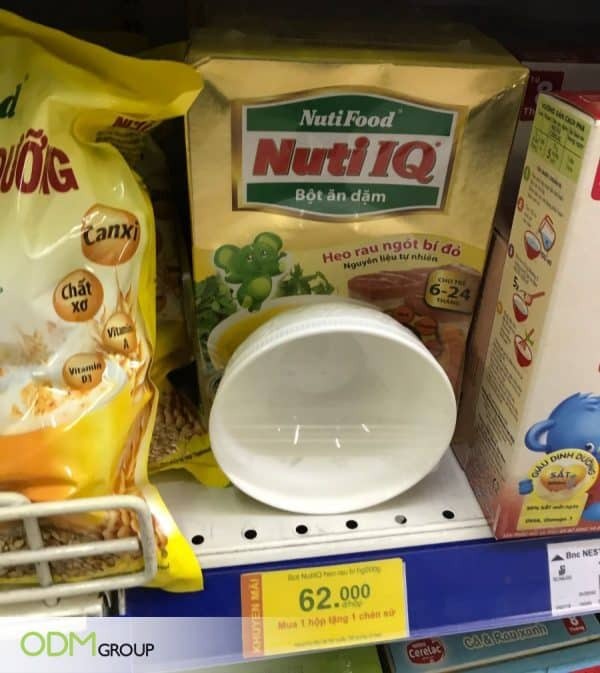 At Co-Op Mart in Ho Chi Minh City, NutiFood, is offering a free custom bowl for every purchase of Nuti IQ Meal. Small and light weight, this free custom bowl make on-pack promotions stand out from the crowd. As a result, a gift with purchase, such as this custom bowl, is an effective way to boost sales. Why we love this free custom promo gift by NutiFood? Practical: The bowl completes the Nuti IQ Meal. It is useful as a container to hold the product for easy consumption. Added Value: Customers will perceived the purchase of these 2 items individually to be more expensive. Hence, the bowl is useful in adding product value. As a result, this increase brand appeal to the customers. Enhancing Customer Loyalty: Offering on-pack promotions is an effective way to show brand’s appreciation for its customers. Moreover, if customers are satisfied with their purchases, it will encourage repurchases. Neutral Design: This increase the marketability of the product to both genders. In conclusion, the benefits to a free custom promo gift is endless! It would definitely improves brand visibility and boost your company’s sales. If this sounds like something your company would benefit from, feel free to contact us. Here at ODM, we have a professional team of designers and manufacturers to tailor to your needs. If you are also interested in a POS display, you will be pleased to see a dedicated list on it by ODM.